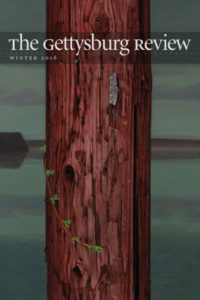 The Gettysburg Review is one of our best literary magazines. For the years I’ve been reading it, first under the editorship of Peter Stitt and now Mark Drew, the content (and appearance) of the magazine has been consistently excellent. The 2017 Literary Magazine Rankings bear this out: TGR ranks #11 in Fiction, #13 in Poetry, and #6 in Nonfiction. Few magazines boast such a strong overall performance. And all you have to do is pick up a copy of the current issue, 29:4 (Winter 2016). I loved the opening story, “Learning About Now” by Kent Nelson and the essay by Peter Selgin, “The Strange Case of Arthur Silz.” The poetry is strong, too, including two by my friend Catherine Staples. I believe all writers should subscribe to (and read!) a few literary magazines. I’m not at all sorry that The Gettysburg Review is one that appears in my mailbox each quarter.